When we look for stability of a feedback system, why do we only concentrate where loop gain is unity and check the phase margin there. The phase of the closed loop system might be passing through 180 but it would still be stable if the phase near the unity loop gain frequency is less than 180. Like in the figure shown below (for negative feedback system), the phase reaches -180 at frequency A but since it is less than 180 at B (unity loop gain) system is stable. Why doesn't the system gets unstable for frequency A? Shouldn't the signal Vi (in the figure) add constructively to signal Vf (inverted twice once due to phase shift of 180 and then due to negative feedback) and grows with time giving unstable system, if operated at frequency A? I know the negative feedback equations (in figure) and the transfer function getting infinite only for |GH| = -1? But still why doesn't the above reasoning holds valid for frequency A? 2.) The shown system is "conditionally stable". That means: It is stable - regardless the properties at the frequency A. However, if you REDUCE the gain within the loop until the gain crosses the point A (the phase remains unchanged) the closed-loop system will be unstable. Such conditional stable system should be avoided because a gain reduction can happen due to aging or other damping effects. Remember: Classical feedback systems with a continuos decreasing loop phase will become unstable (under closed-loop conditions) for rising gain values (beyond a certain limit) only. As to your next question - the input signal Vi does not influence stability properties at all. Stability is determined by the loop components only. That is the reason, we investigate the loop gain only. EDIT: Here is an explanation why the closed loop (your example) will be stable: If a closed-loop system is unstable, this point of instability also must be "stable". That means - either we will have "stable" and continuous oscillations or the output is latched at one of the supply voltage rails. In both cases, this point of instability is fixed. Now - what happens at the point A in your example? Here we have a rising phase which is identical to a NEGATIVE group delay at this point (group delay is defined as the negative phase slope). This is an indication for the unability of the closed-loop system to let the amplitudes rise (oscillations or latching at the supply rail). Rather, the system returns to a stable operating point. A final information: The stability check investigates either (a) the -180deg line or (b) the -360 deg line. 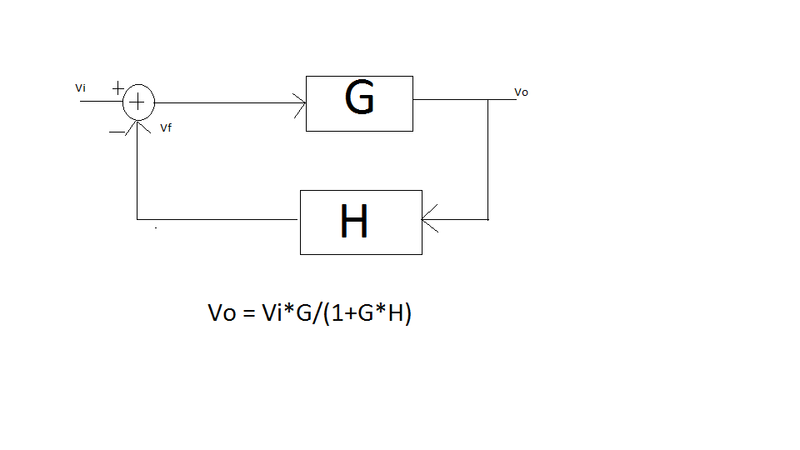 This depends on what you are investigating: (a) Either the simple product GH or (b) the loop gain LG which is LG=-GH. 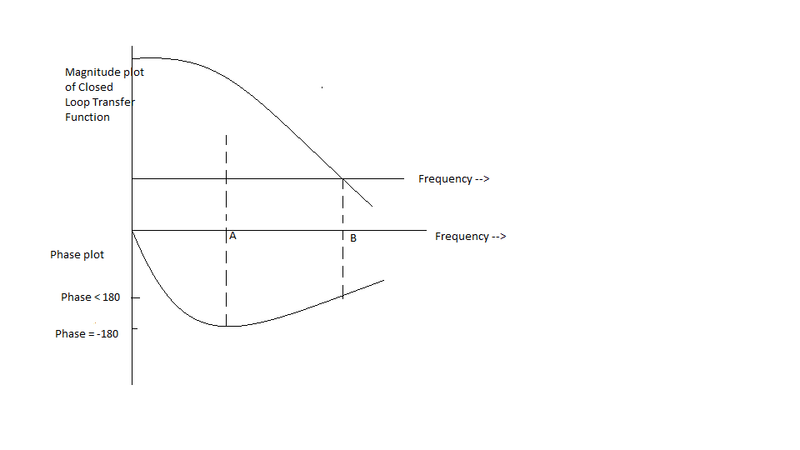 The concept of checking the phase angle at unity gain only applies to simple systems in which the phase-vs-frequency plot is monotonic, where the assumption is that the phase angle is only increasing with frequency, and that as long as the phase margin is sufficient at unity gain, then it can only be better at lower frequencies. This assumption does not hold in the example you give, since the phase plot is not monotonic. Therefore, you must do a more complete analysis. Any system that has greater than unity gain and a total of 360° of phase shift (including systems with inverting amplifiers and 180° phase shift) at some frequency will oscillate. Let's assume the phase continues to fall at frequencies greater than point B and ultimately crosses -180 degrees (again). This assumption makes Bode analysis valid (because a rising phase and falling magnitude is indicative of a RHP pole that calls for further analysis). Otherwise you need to use the Nyquist Stability Criterion which is more universally valid (e.g. right-half poles). This type of a system is very common in DC-DC Buck converters. It's a Conditionally Stable system. 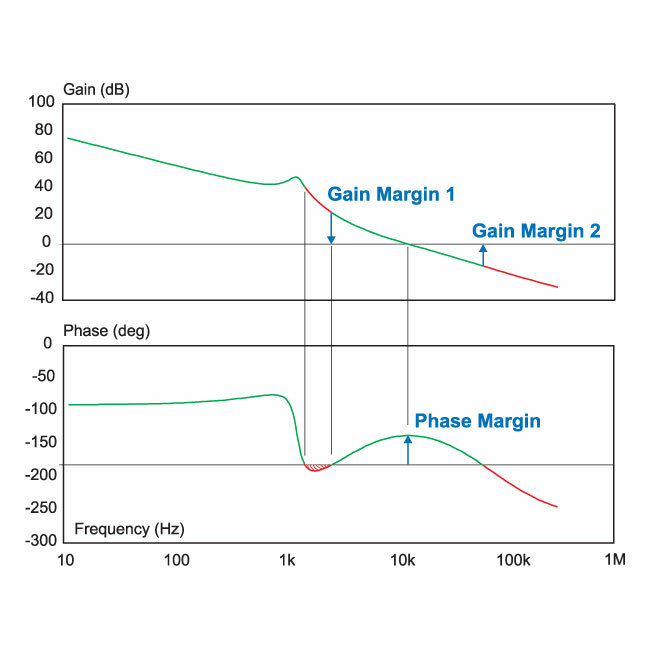 This means that lowering or increasing the gain by a sufficient amount (the Gain Margin) will cause oscillation. A conditionally Stable system has both an Upper and a Lower Gain Margin. Using Bode analysis, you're analysing the Characteristic Equation: L-1=0 where L is the Loop gain. The solution to the characteristic equation occurs at L=1 or L=0dB. That's why you analyse the phase shift only at 0dB. To cause instability (sustained self oscillation), the phase has to be exactly 0 degrees and gain has to be equal to or greater than 1. Given that there is 180 degrees phase shift due to the circuit being an inverting amplifier, if the amplifier itself doesn't produce an additional phase shift of at least 180 degrees, then it won't oscillate. Having said that, the frequency response when the loop is closed will not be ideal and there will likely be severe "ringing" on some signals but, it won't reach "classic" instability. Not the answer you're looking for? Browse other questions tagged feedback stability negative phase-margin or ask your own question.